A sunrise photoshoot in the drying Colorado River Basin leads to more than images — Circle of Blue director J. Carl Ganter’s meeting with Governor Stephen Lewis of the Gila River Indian Community. 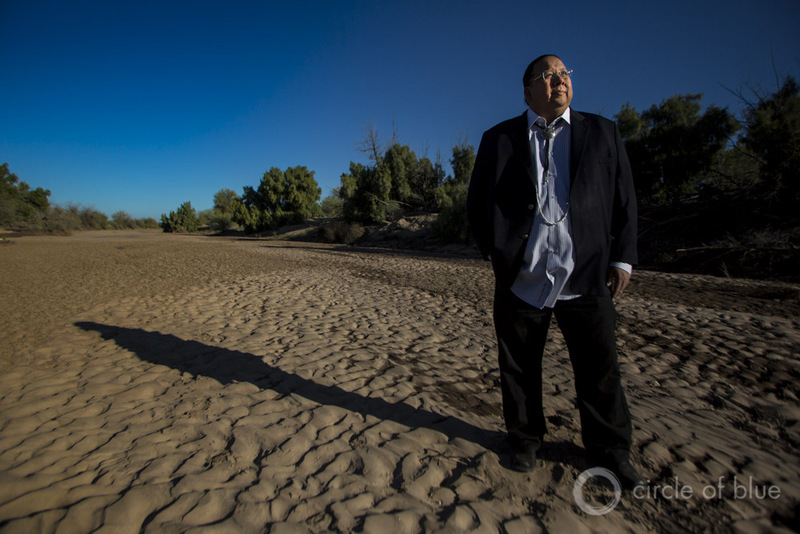 Governor Stephen Roe Lewis, leader of the Gila River Indian Community, stands in the dry bed of the Gila River outside of Sacaton, Arizona. Elected last year, Lewis proclaimed 2015 the ‘Year of Our Water Rights’ for his tribe. Click image to enlarge. SACATON, Arizona — The governor was late, and we were missing the golden light. I had asked Stephen Lewis, leader of the Gila River Indian Community, south of Phoenix, to stand for a quick picture at sunrise on the dry bed of the Gila River, a tributary of the Colorado River. A few minutes after he arrived, his cellphone rang with a call from his community’s water rights attorney in Washington, D.C. Someone had alerted the attorney to my presence. Native Americans hold rights to 20 percent of the Colorado River’s flow, reported Circle of Blue’s Brett Walton last week. How they use their water will shape the future of the Southwest. But nearly every Native American community leader, including those in the Gila River, declined Brett’s interview requests. “We keep our water-right plans confidential within the council and do not speak with the press,” a spokesperson from another tribe told him. Yet, while much of the United States — and particularly the American Southwest — struggles with water scarcity, tribal leaders may become the ultimate arbiters. Governor Lewis passed the phone to me, and I explained to the attorney my desire to make a few pictures. “Circle of Blue. I read your work,” the lawyer said. After a few photographs, the heat from the desert sun began to take hold, and we walked down the riverbed back to the main road. I paused and presented the governor with a Petoskey stone that I was carrying in my pocket; Petoskeys are fossils that are only found on the Lake Michigan shore of northwestern Michigan. He rolled the polished rock in his hands, and we contemplated the symbolism of this ancient pebble, plucked from what is now one of the world’s largest stores of fresh water. We stood quietly for a moment on the parched earth of Arizona, in a place where water’s future could be defined by a shared vision or an epic battle. With a gentle motion, Governor Lewis removed the necklace of shells he was wearing. He placed it over my head.